Here we are, 50 hours in beautiful San Sebastian, and already the city is capturing us! Eighteen of the full group of twenty students and one Professor Sean Conway from UMass Lowell left on the 4:40pm flight to Frankfurt, Germany at Logan Airport. We gathered in groups around Terminal E and talked excitedly about what was to come, or at least what we could imagine was to come. A little nervous banter here and there, but that is to be expected when flying to a new place. This first flight lasted no more than 8 hours, but we came into Frankfurt 5:40 am local time, so I think I can speak for all when I say that we definitely felt weird during our five hour layover. We took it stride, however, and meandered around the airport just as more bakeries and stores were opening for the day. People from all across the globe with different styles and thick accents meandered with us. By the time we reach America again, it is all right to say we travelled to Spain AND Germany! . . . sort of. Finally, we made it onto our connecting flight to Bilbao in one tired, smelly, but still excited piece. Once in Bilbao, we took our time to retrieve our luggage and it was off to the bus to take the hour journey into the city of our new home, San Sebastian. The bus pulled up in front of a gigantic Calvin Klein sign on a cobblestone road. This sign distracted me for a second, but as soon as I got a quality 360 degree view of my surroundings I saw a magnificent square lined with old-style ornate shops and restaurants. This is where we paired off with our host families. My roommate, Mara, and I followed our host mother’s daughter and boyfriend along more cobblestone roads and the ocean to the apartment. Up 6 floors, we met Marian who was happy to see we arrived safely and showed us to our room. The rest of this afternoon we spent trying to keep ourselves from falling asleep, and staying awake until at least 11pm to escape jetlag the next couple of days. Official day 1 began with a 7:30 breakfast at our home-stay, followed by a guided walk to the school we will be attending for these three weeks, Lacunza. Here, we were first randomly divided into classrooms where we took a two-part written placement test and one-part oral test. Teachers streamed in and out, giving different welcome presentations and answering questions in “Spanglish.” By 11:30, it came time to split into the different groups based on level and expertise in Spanish. I was, no surprise, placed in Level 1, but UMass Lowell had a good range of levels overall. Until 1:00, we were in classes where only Spanish is spoken. To say the least, I received more information in that one class than I have the whole summer leading up to this trip! 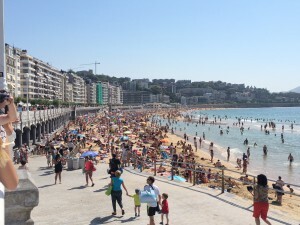 From there, we had three hours to ourselves before we met back at the school for a welcome tour of San Sebastian. During this time, we split off into groups, and my particular group wandered off to dine at a pintxo bar specializing in seafood. 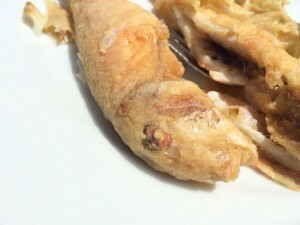 My salmon was not what I expected, with eyes that looked right into mine – but no worries, I still ate it. Off to the tour at 4:00: we were guided to old and new parts of San Sebastian. My favorite part was looking down both sides of the straight road that connected two old churches at each end. 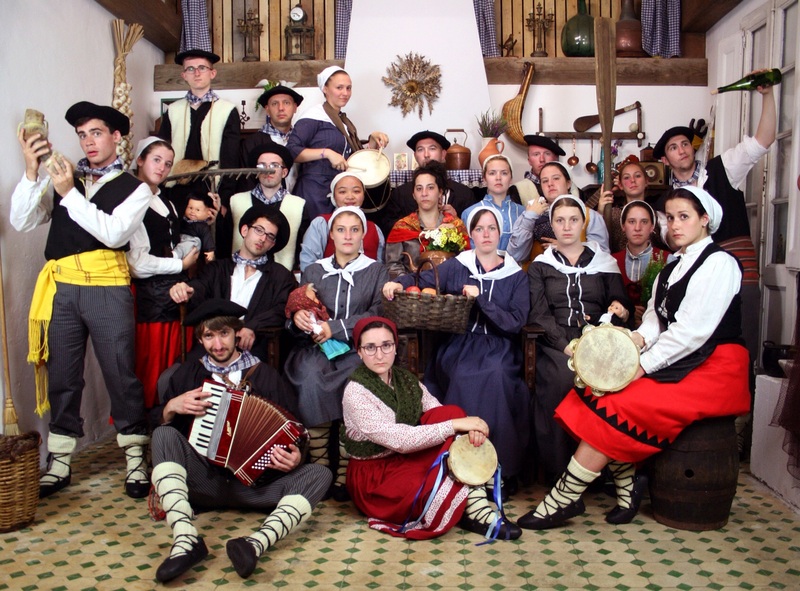 After the tour, we were surprised with a traditional Basque photoshoot; one of our pictures precedes this post, and should most definitely be viewed. To end this beautiful first official day in San Sebastian, we officially met everyone on our group officially. It was pretty official. At the foot of a mountain, and overlooking a harbor during sunset, we reviewed the logistics for the trip; including who would write which blog post. I volunteered for the first day, which leads us to the present. I’m looking forward to really jumping into this city even more, so I must say adios! One of San Sebatian’s gorgeous beaches, La Concha. You can tell that beaches aren’t very popular here. 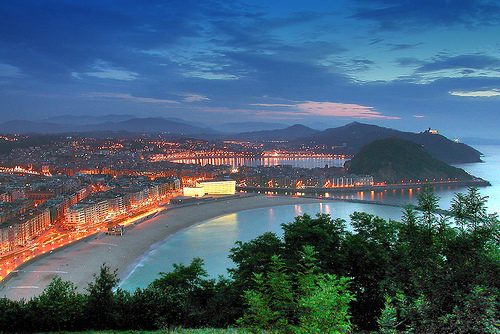 Students in the Honor’s College study abroad program are settling in quite nicely in their new home for three weeks – the beautiful San Sebastian, Spain. The weather has been amazing, the views are amazing, and so are the pintxos. The students are excited to be here, to learn and experience some new things, and of course meet new friends!